The Wilkins Ice Shelf, a major ice shelf on the Antarctic Peninsula, lost a significant piece of ice at the end of March 2008. Dr. Angelika Humbert from the University of Münster in Germany, explained the developing stiuation to SciencePoles. Has the condition of the Wilkins Ice changed much since the initial break-up was reported at the end of March? Is it still hanging by a thread? We still see a thread as a connection between the two islands where the break-up happened. In connection with this break-up event a failure formed and extended, and now about 2,650 km2 are hanging by a thread. Even if you make the worst-case prediction it would be from today's situation a loss of 5,000 km2. But still 8,000km2 would survive. So I wouldn't say it's a complete disintegration. Do you think the section hanging by a thread might still break off this year or perhaps during next year's melting season? It's not that easy to determine. Because sea ice formed in winter has a very low thickness and produces a very small amount of pressure against the ice shelf, it's quite difficult to say if this could really "contain" the ice shelf so that it wouldn't break up. The 2,650 km2 of ice are hanging by a thread on two sides: close to the islands, where the recent break-up happened, and in the central part of the ice shelf where the rest is moving very slowly. It could take a year or two before it happens, but nobody knows exactly. Another break-up event could also happen suddenly but we wouldn't be able to calculate when it would happen. So it would really be impossible to predict a major break-up event such as this? It would be impossible to predict the exact date. If you have a catastrophic break-up, then that means that there is something triggering it. There might be many factors that could really be behind the break-up, and these things really aren't predictable. We're able to understand the mechanisms why things are breaking up but I'm very sceptical if you can really predict an exact time. What do you think were the exact mechanisms that lead to the break-up? I believe that a rift in the ice shelf formed and eventually led to its break-up due to bending stresses that are extended across this ice shelf. The ice has a different thickness in different places and the different thickness and the buoyancy forces lead to bending stresses. If these stresses are released, they are released on a very short time-scale. How would you put the recent break-up of the Wilkins Ice Shelf into the context of the break-up of other ice shelves along the peninsula over the past 30 years? Isn't this the furthest south on the peninsula that an ice shelf has broken up? It's difficult to put it into context because the Wilkins is a very special kind of ice shelf. It consists mainly of ice that is formed by accumulation of snowfall. There's not much glacier inflow. It has brine infiltration, which means it has a completely different crystalline ice matrix. It runs aground on the so-called ice rises. It has an extraordinarily large number of ice rises, which here destabilised the ice shelf and created failure zones. It's quite difficult to compare that with the break-up events of other ice shelves along the peninsula. And it's also important not to confuse ice shelf disintegration with ice shelf break-up. What we're seeing with the Wilkins Ice Shelf are break-up events. Ice shelf disintegration is a different process. 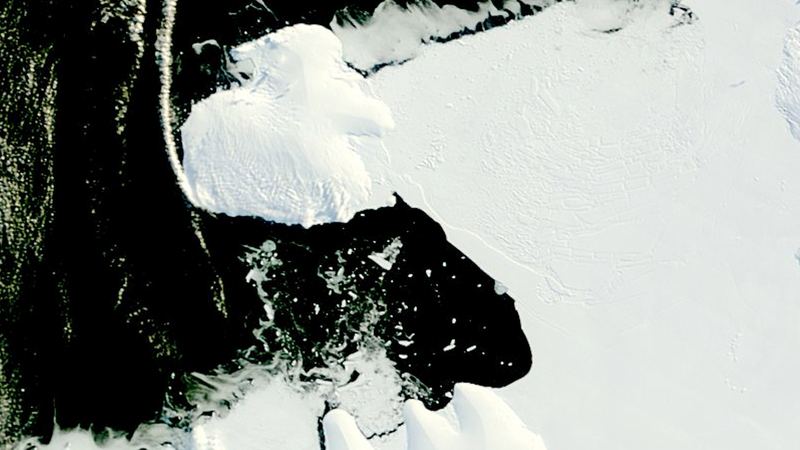 The Larsen B Ice Shelf disintegrated in just a few days. And now with the Wilkins Ice Shelf we're seeing break-up events, which always release large masses of ice, but the ice shelf is still there. It's quite a normal thing that icebergs calve off ice shelves. But there are two mechanisms involved. The first is ordinary calving, in which the ice shelf extends a little bit and breaks off to an equilibrium line. This is healthy for an ice shelf. The other is if you have break-up events, you lose a lot of mass all at once and usually the ice shelf is not growing anymore. We can show that this is clearly happening with the Wilkins Ice Shelf. How does the ice shelf grow to begin with? You have inflow from glaciers. An ice shelf needs to have reasonable speed at which its advance can happen. But the Wilkins Ice Shelf is advancing at a very low speed, something like 60-90 metres per year. If 1,200 km2 were to break off, it would take a very long time for it to grow back. Can break-up events such as the Wilkins Ice Shelf break-up lead to a kind of positive feedback situation where the initial break-up leads to further ice loss on the ice shelf? They do if a failure zone, or weak zone, develops inland far from the edge of the ice shelf. This can lead to a positive feedback because the ice shelf doesn't "heal" anymore. Sometimes you can have rift healing on some ice shelves, but this doesn't seem to be happening on the Wilkins Ice Shelf. So with every new break-up in the ice front, the failure zone in the interior of the ice shelf is growing and that's a positive feedback. What's the next step for the scientific community in monitoring the ice shelf? What we have right now are plausibility arguments. What we need to do is take a step forward form plausibility to causality. To do that, we definitely need to do more observation. If we don't have enough observation it won't be possible to get this causality, which is really needed to get the link to climate warming or to other factors leading to the break-up or disintegration of ice shelves. What parameters need to be observed? We need to look at the ice shelf in two ways: The first way is monitoring the whole system using satellites in order to see for example if rift systems are developing. The other way is by doing field studies of glaciological parameters. Someone could measure the ice shelf in-situ in order to gain a better understanding of the properties of the ice, including the speed of the ice shelf, ice thickness, ice density, the fracture toughness of the ice, and other mechanical properties. Dr. Angelika Humbert of the University of Münster in Germany specialises in researching ice shelf dynamics. Having obtained her doctorate at the Department of Mechanics at Darmstadt University of Technology, and currently a member of the Polar Geophysics Groups at the University of Münster. In addition to the Wilkins Ice Shelf, she has also studied the Ross, Fimbul, George VI and Brunt Ice Shelves in Antarctica.